Campaigners in Wales are celebrating as legislation to phase out brightly coloured and slickly designed tobacco packaging in the UK takes effect tomorrow (Friday). All tobacco products must now be produced in plain, standardised packs with large picture health warnings. Shops and retailers have 12 months to sell existing packets. Cancer Research UK began campaigning for plain, standardised packaging in April 2012 and more than 90,000 people from across the UK took action to support the campaign. The Welsh Assembly was the first UK legislature to vote for a ban on smoking in public places and similarly commuted early to this important public health measure. 19 per cent of people in Wales smoke cigarettes*. More than 100,000 people die in the UK every year from a tobacco related illness, with 14 types of cancer caused by smoking. Two thirds of long term smokers die from a tobacco related disease. Plain standardised packaging means all cigarette and hand-rolled tobacco packaging will look the same. The United Kingdom and France join Australia as the first countries in the world to introduce similar laws. Australia’s legislation took effect in December 2012. Karen Davis, Cancer Research UK spokesperson for Wales, said: “The introduction of standard packs marks an important milestone in our efforts to reduce the devastating toll that tobacco exerts on so many families every day. It’s the beginning of the end for packaging that masks a deadly and addictive product. 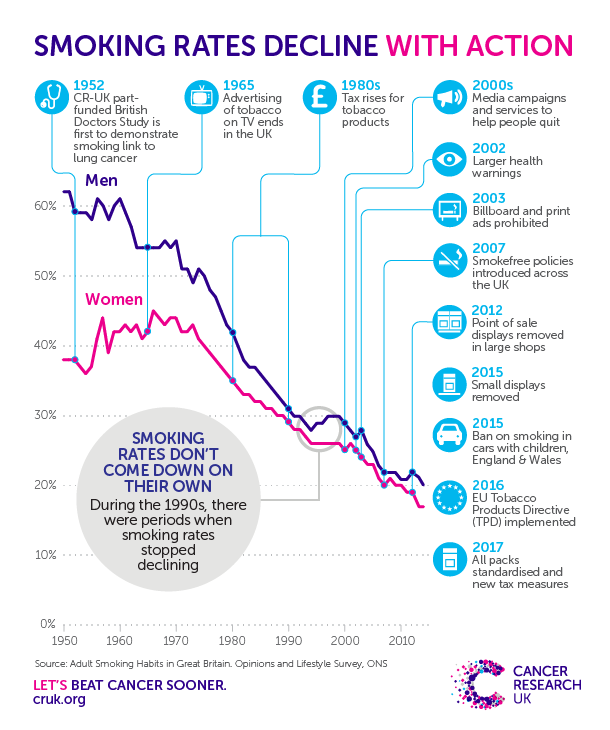 Cancer Research UK also remains committed to helping current smokers quit the habit, following a report published by the charity** which revealed that cuts to public health funding mean local Stop Smoking Services are being closed down. The campaign asks the public to support a simple solution to the problem – making the tobacco industry pay for public health services and mass media quit campaigns to help save thousands of lives. By charging the industry around 1p per cigarette sold in the UK, an extra £500m could be raised and spent directly on tobacco control.